Photographers and artists often use text or logo watermarks to display their brand, to indicate that the work is protected by copyright, and/or to identify the photographer or artist by name. In my case, I’ve chosen to use a (250x70px PNG) watermark that duplicates the logo in the banner of my website. You can do a Google search to find instructions on how to create a logo or text watermark with a transparent background (usually a PNG file). 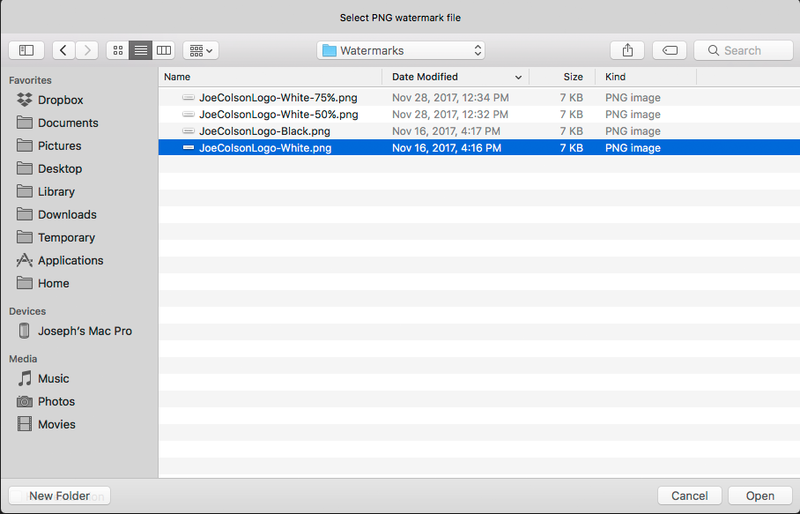 Once you have created your watermark, save it to a convenient location that you can find later from the FrameShop dialog box. On the Signature tab, you’ll find a new signature option – Watermark. Select that option, click Select file…. Now browse to the location of your watermark file. 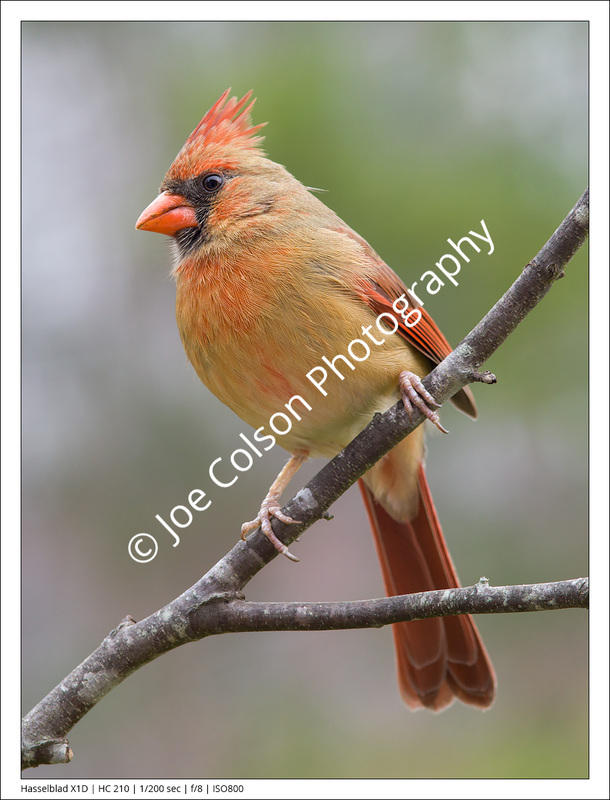 Select the watermark file and click Open. 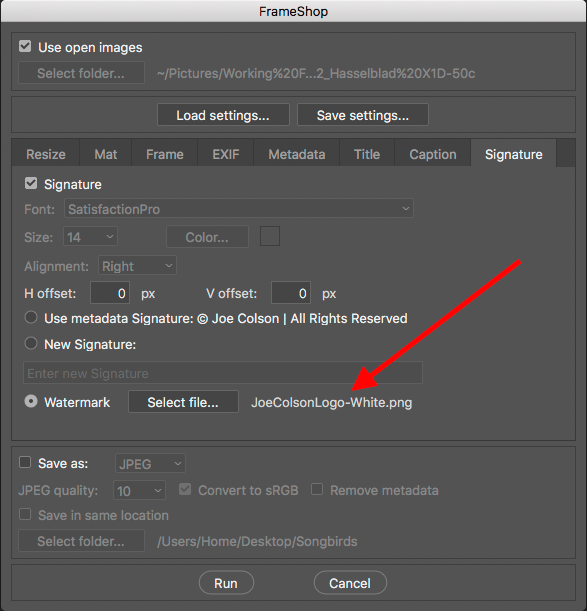 The Signature tab will now show the selected watermark file name next to the Select file… button. By default, the watermark is positioned in the lower right corner of the image space. Run the script without checking the Save as box to ensure the watermark is positioned where you want it to appear. 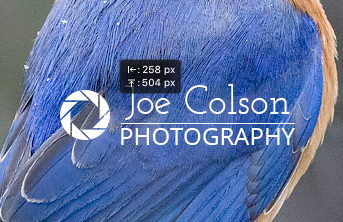 If the initial position of the watermark isn’t where you want it, Photoshop makes re-positioning easy. Select the Photoshop Move tool and make sure the Watermark layer is selected. Move the watermark to the new position, noting the values shown for the Move tool (as offsets from the default watermark location). Enter those values as H offset and V offset values in the dialog box Signature tab. Negative values will move the watermark up and to the left. Positive values will move the watermark down and to the right. 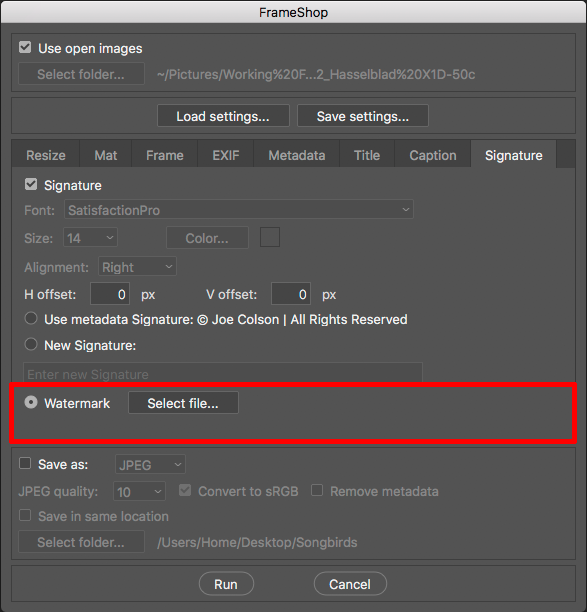 Tip: Running the script without checking the Save as box is useful when determining how to set the options, particularly the text and watermark offsets, or when you desire to manually adjust the layers in Photoshop. 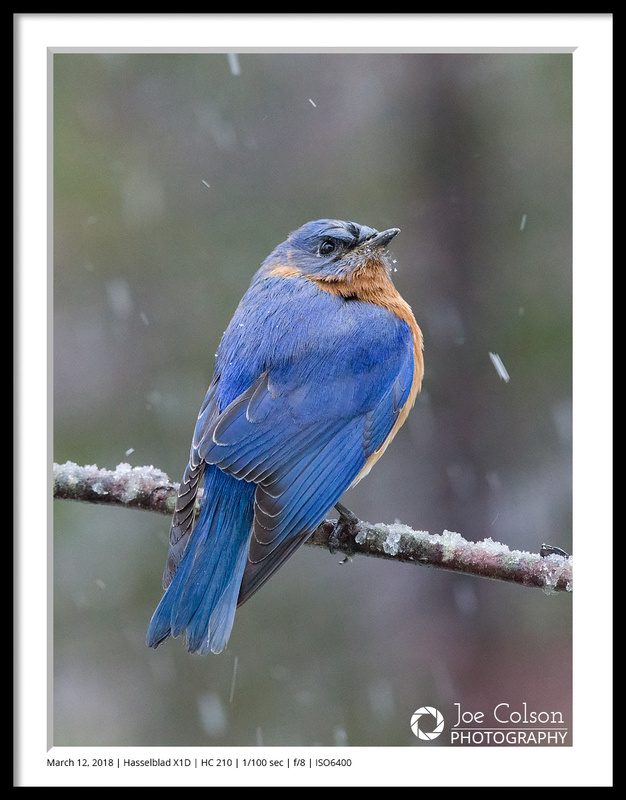 For example, with the Layers panel open in Photoshop, you can edit the text layers (EXIF, Title, Caption, Signature), adjust the placement and/or opacity of the Watermark layer, set colors for the Mat and Frame layers, and/or adjust the layer effects. Now you can run the script, first setting the Save as options as desired. Download the .zip file and, after unzipping, copy or move the script (named FrameShopv1.1.0.jsx) to the Adobe Photoshop Scripts folder (Adobe Photoshop CC 201x/Presets/Scripts or Adobe Photoshop CS6/Presets/Scripts). The name of the script will be displayed in the Adobe Photoshop File/Scripts menu the next time Adobe Photoshop is started. Scripts added to the Scripts folder while Adobe Photoshop is running will not appear in the Scripts menu until the next time you launch the application. You can also run the script by using the Adobe Photoshop File/Scripts/Browse… menu selection. Using the file browser that appears for your operating system, browse to the location of the script and select it. The script requires Adobe Photoshop CC or CS6, and will run on a PC (Windows 7 or 10) or Mac (OS X). This version (v1.1.0) will not run on Adobe Photoshop CS5, earlier versions of Adobe Photoshop or on Adobe Photoshop Elements. See the next paragraph for localized versions of the script. Update (April 4, 2018): Thanks to help from a user of the German language version of Photoshop, I have added a German localization of the script to the download list. While the dialog box labels and help tips have not been translated, the EXIF identification and enumeration works and has been tested by those very patient and helpful users. My thanks to them and to other users who help with script localization and testing. This entry was posted in Uncategorized and tagged EXIF, Frames, FrameShop, Photography, Photoshop, Scripts.